Most Shopping Malls have thousands of different customers/Audience at their Mall every day. Some are regulars, and others only visit you once. Knowing who your customers are, how often they visit, what they want to buy, experience etc. have tremendous value for a mall. When you also can use this information in your communication and marketing, you get a huge advantage on your competitors. In this document you will find information on how to communicate, recruit, personalize information and get loyal customers. Recruit your customers and get their consent to communicate with them in accordance to current laws and regulations through: SMS, QR code, website, email, social media etc. Get insight by getting information directly from your customers or add other interesting information, so you can differentiate your message to be perceived as relevant to your target audience. Use your database and insights to talk with your loyal customers. All distribution will allow you to measure the effect of TargetEveryone's analysis tool. Also, use the right channel to the correct person based on which channel the customer wishes to receive your message. Welcome messages, promotions, information can be automatically pushed to the customer. Personalized SMS with landing pages can be sent through a platform. Newsletter information and promotional emails can be sent from same platform. Campaigns with birthday offers, videos of events, coupons, giftcards, Sign-up, feedback forms. Recruitment is the essence of building a database of loyal customers. Have a clear membership goal for your club, develop a strategic plan & establish a budget. Ensure that your members feel important. Have incentives for recruitment - make it fun and exciting for new and existing members. 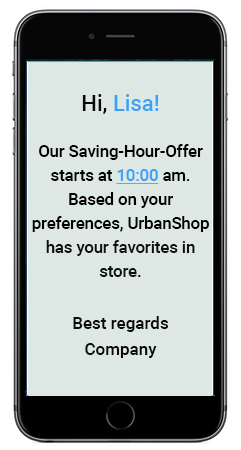 The conversion rate is much greater by using personalized and insight-based SMS messages or newsletters! Get your own link and URL for a red thread through all your digital communications. Offering discounts to your customer is always a benefit for them, but how can you also benefit with it. 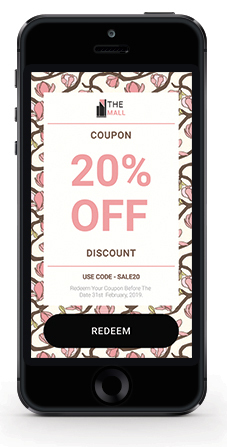 Sending customers valuable coupons creates a will and need for your product, it makes the client go to your store to a non previously planned purchase. Once they are in your store they can be impacted by other products, generating a shopping chain. Coupons can be used to “Buy 1, get 2” campaigns, for example. Its is set to a specific time, with start and end date. As the client must present it on store, it is easy to perceive the campaign impact results. Engage your entire club - work together with your retail brands to make offers and insight driven campaigns. By using the mobile app you can communicate with your members more efficiently than other channels. Connect GEO fence, Beacon, Wifi to the APP, allows your members to get your message at the right time. Reach and target your customers based on their current location outside your store.